Stunning Maui Sunset 123B ~ 3 BR, 2 BA, Renovated Ground Floor Condo! Beautifully, renovated ground floor 3 bedroom, 2 baths deluxe condo! The new Owner's spared no expense for furnishings and entertainment system. There are 2 queen beds and 2 twins in the 3rd bedroom. A/C in all bedrooms and living room. Both bathrooms have been fully remodeled with 1 Jacuzzi tub. There is a 60" flat screen in the living room, which is also connected to Netflix + Bose audio system. For families with a small little one, a pack n play is provided! 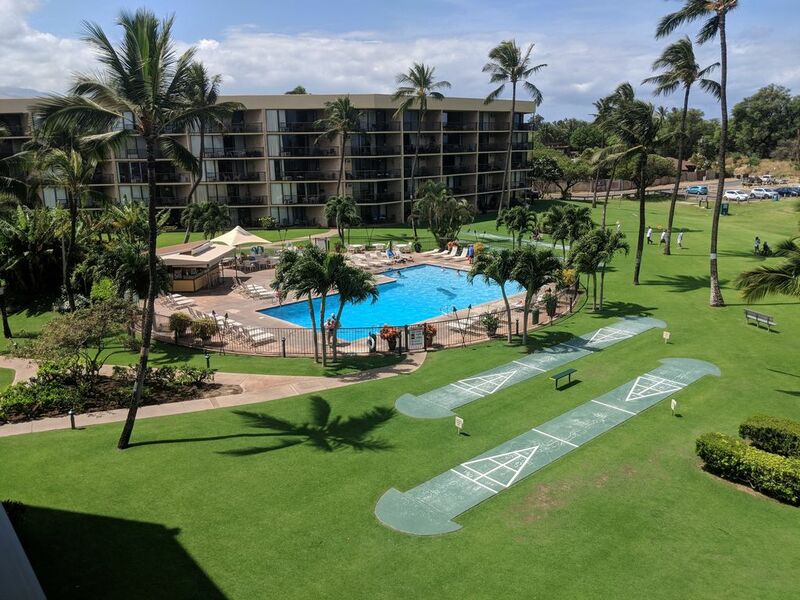 Good walking, windsurfing, kitesurfing beach fronts this oceanfront condo complex in North Kihei. A couple of minutes away from Kamaole Beach I, one of the great beaches on the sunny South shore. Complimentary High Speed Internet PLUS WI-FI. Please note, there is a 7 night minimum & Christmas is a 10 night minimum. Kumulani Vacations specializes in South Maui Vacation Rentals and Real Estate on Maui. Offering fully furnished Maui Condos along with all Islands. In business since 1984, we have Maui vacation rentals available around the island, from Hana to sunny south Maui, including Kihei, Wailea, Lahaina, Kapalua, and Kaanapali. Our large inventory of Maui condominiums includes Affordable to Luxury Accommodations! Inquire NOW for a Summer/Fall discounted rate! Perfect for a relaxing family vacation! Ground floor, great for children! Large walk in shower in Master bedroom and 2nd bathroom has a jacuzzi tub. Ocean views, Exercise room, large pool, jacuzzi, shuffleboard, putting green on beautifully manicured grounds! Amazing location and beautiful condo! This condo exceeded our expectations! The beds were super comfortable, the kitchen very well stocked with really good quality appliances and dishes. Comfortable furniture and lots of space for 6 people! The grounds are amazing - soft grass, great pool and hot tub and fun games to play. It was also quiet which was wonderful for reading in our lawn chairs while enjoying our afternoon pina coladas and taking in the breathtaking view! We would definitely go and stay again. Thank you!! Perfect Location and Setting for a family! We stay at Maui Sunset every year for our vacation. It's literally our home away from home. This condo is an excellent base for all Maui has to offer. It is well equipped for cooking, hanging out and going to the beach. It has plenty of games and beach toys. Being on the ground floor gives you extra space and it is nice to just walk out on the lanai to go to the pool. You won't find a condo with a better manicured grounds. We find the kitchen well equipped with all we need for cooking, which we prefer to going out. Kihei is a great location that is close to the stores or to the beaches in Wailea. The beach in front of the condo is not a good swimming beach but there are plenty of places within 10 minutes and the pool is great. I've stayed in several condos on the island, and Maui Sunset 123B is by far the roomiest and well-furnished condo of them all. From the moment we arrived we enjoyed all that 123B had to offer. The view from the ground floor lanai is beautiful. The kids loved that they could walk out the sliding doors and straight to the beach, pool and outdoor activity areas. The grounds are pristine, and the lawn....you MUST walk barefoot on that grass! The kitchen is well-stocked and the utility closet has everything you might need, especially if you have children. Lots of play and beach items. Be sure to stick around each night to watch the sunset while lounging on the lanai. You will not be disappointed. I give Maui Sunset 123B a rating of 5+ stars. Mahalo to Wendi at Kumulani Vacations. It was a pleasure working with you. Aloha. once again we were in our home away from home. We stay here every year and each time its an incredible time.